This is an ingenious scoreboard with the capacity to be linked up to a ute and taken from ground to ground around the WA wheatbelt. The CV of the scoreboard attendant would need to include ‘car has a towbar’. The teams on the board in this photo, taken just before Christmas 2010, are Burracoppin and Nukarni. Merredin no longer has a team in the Eastern Districts Football League. 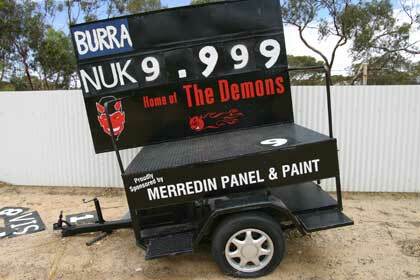 Merredin Oval has been the home ground of Nukarni since 2008. Probably Merredin’s finest footy product was East Perth’s Ken McAullay who won two Simpson medals and the Tassie Medal in 1972, as well as playing in the drought-breaking premiership team for the Royals when he won the Simpson Medal.